Published: Sept. 14, 2014 at 10:30 p.m. Updated: Sept. 15, 2014 at 07:49 p.m. The waiver wire is one of the most important keys to finding success in the world of fantasy football. Each week, I'll offer 10 players you need to target off the free-agent market as you look to reach your ultimate goal -- winning a league championship! 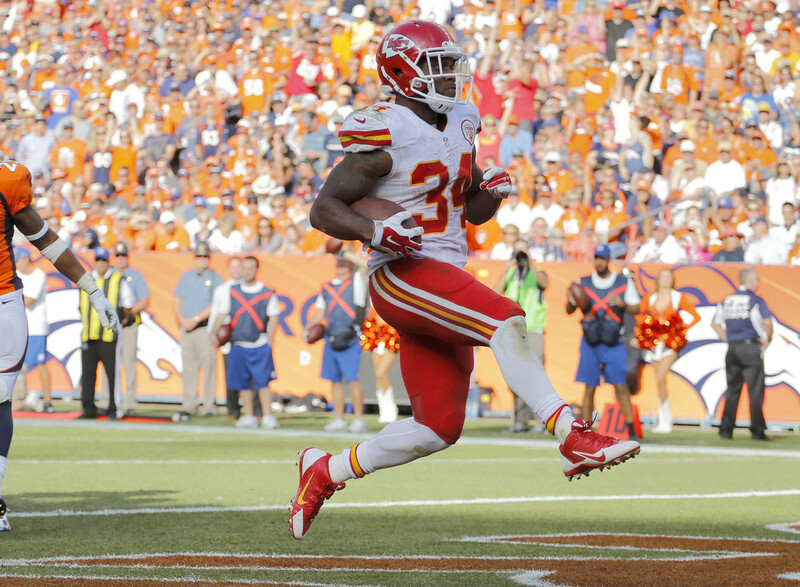 Jamaal Charles was forced to leave Week 2 with a high ankle sprain and was unable to return. In his absence, Davis went off for 28 touches, 103 scrimmage yards and a pair of touchdowns. Furthermore, you could argue that he looked better than Charles did before he went down. Last season's top fantasy runner is likely to miss some time, making Davis a viable fantasy starter in all formats. Brown, who was a top-25 fantasy running back in 2013, appears set to earn more carries in the Chargers backfield with the status of Ryan Mathews (knee) up in the air. Should Mathews be forced to miss time due to the ailment, Brown would likely move into a starting role for head coach Mike McCoy. In such a scenario, Danny Woodhead would continue his role as a change-of-pace back and passing-down specialist. With Mark Ingram expected to miss a month with an injured hand, Robinson just became the back to own in New Orleans. He should assume the majority of the rushing duties, with Pierre Thomas operating in the Darren Sproles role in the backfield. Ingram has produced 34.5 fantasy points thus far as the Saints de facto lead back, which means Robinson could be in line for some solid production. Rainey, who was a useful fantasy runner for part of last season, is again playing a bigger role with Doug Martin (knee) out of action. He thrived against the Rams, rushing for 144 yards. With a short week ahead (the Buccaneers face the Atlanta Falcons on Thursday Night Football), Martin is no lock to be back in the lineup for Week 3. Such a scenario would make Rainey a legitimate flex starter for owners. Walker went off against the Dallas Cowboys, catching 10 passes for 142 yards with one touchdown to finish with an impressive 20.20 fantasy points. It was the second time in as many weeks that Walker has found the end zone, making him a prime add for those owners who need a tight end. That's a long list with both Jordan Cameron and Jordan Reed out of action. Walker faces the Cincinnati Bengals in Week 3. Stewart had a dreadful 2.5 yards-per-carry average in a win over the Detroit Lions, but he did find the end zone once and finished with a solid 11.90 fantasy points. As long as the Panthers are without their veteran lead back, DeAngelo Williams (thigh), Stewart is worth a roster spot in most fantasy leagues. He'll have a plus-matchup against the Pittsburgh Steelers' questionable run defense in Week 3. Jones has quietly had a nice start to his first season in Silver & Black, scoring a combined 24.60 fantasy points in his first two games as Oakland's top wide receiver. That includes a strong stat line in Week 2 that saw him post nine catches, 112 yards and one touchdown. When you also consider his developing rapport with rookie quarterback Derek Carr it's easy to see why Jones is rosterable in all formats. The NFL Players Association has approved the league's drug policy, and an agreement could be finalized soon. This agreement could bring the return of Gordon at some point late in the 2014 campaign, so he is well worth an add-and-stash in all fantasy formats. Remember, Gordon was the top-scoring wide receiver in fantasy land in 2013. He could turn into a significant roster asset during your postseason push. Robert Griffin III suffered a dislocated ankle against the Jacksonville Jaguars, which opened the door for Cousins to come in and show his stuff. He was impressive in the stat sheets, throwing for 250 yards with two touchdowns and no interceptions, and an upcoming matchup against the Philadelphia Eagles is favorable. With Griffin III down, Cousins becomes a viable option off the waiver wire for Week 3. A preseason deep sleeper, Kelce made an impact for the Chiefs and fantasy football owners with four catches for 81 yards in Week 2. A talented pass-catcher who plays more like a wide receiver, the Cincinnati product is developing a nice rapport with Alex Smith and will no doubt be used more in the pass attack as the season wears on. Kelce isn't in the top-10 tight end conversation, but he is trending upward.